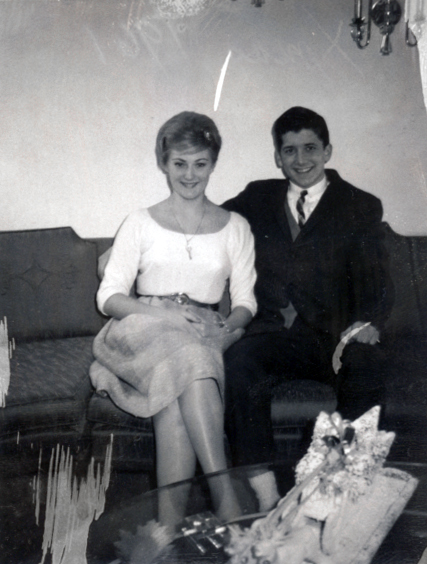 This photo was taken of my Mom and Dad at Christmas in 1961. I'm posting it because they look wonderful and it's a little bit easier to look at old photos of my Mom right now. My Mom passed away peacefully one week ago on December 6th surrounded by her family. It's so surreal I can't quite put it into words. Everything will forever be different without her around. She took care of everyone - people and animals alike - that crossed her path. I'm not sure what I will do without her. The good thing is that I have such a wonderful family that really took care of me and Ed and my Dad. My sister-in-law, aunts, uncles and cousins visited and brought so much delicious home cooked food. My Dad, brother and nieces were so strong. Friends reconnected and gave me comfort. What else can I say but thank you all from the bottom of my heart. I also want to thank everyone for their kind words and well wishes for me and my family. It means so much to know that even though we may have never met in person or don't know each other personally, you took some time to write a little something or just even to have read this post. Rest in peace Mom and thank you for everything.